The acclaimed modern science fiction masterpiece, included on Library Journal's Best SFF of 2016, the Barnes & Nobles Sci-Fi Fantasy Blog Best Books of 2015, the Tor.com Best Books of 2015, Reader’s Choice, as well as nominated for the Arthur C. Clarke Award, the Kitschie, and the Bailey's Women's Prize. Follow a motley crew on an exciting journey through space—and one adventurous young explorer who discovers the meaning of family in the far reaches of the universe—in this light-hearted debut space opera from a rising sci-fi star. 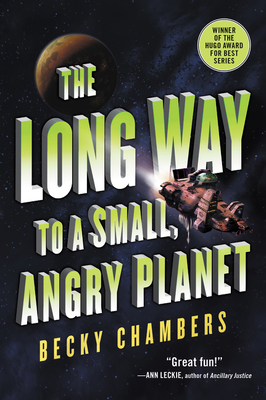 Becky Chambers is the author of the science fiction novels The Long Way to a Small, Angry Planet, A Closed and Common Orbit, and Record of a Spaceborn Few. Her books have been nominated for the Hugo Award, the Arthur C. Clarke Award, and the Bailey's Women's Prize for Fiction, among others. She also writes essays and short stories, which can be found here and there around the internet. In addition to writing, Becky has a background in performing arts, and grew up in a family heavily involved in space science. She spends her free time playing video and tabletop games, keeping bees, and looking through her telescope. She lives with her wife in the woodsy north of California.